Modelling? Ivy would rather lock herself in her coffin than strut down a catwalk. But now the Café Creative fashion show is just around the corner. Everyone in Franklin Grove is ready to strike a pose. Ivy is the only one who’d rather die. Except she’s dead already. But strutting down the catwalk becomes the least of Ivy’s worries when a priceless gem goes missing. Is there a couture crook in Franklin Grove? Olivia and Ivy must find out. 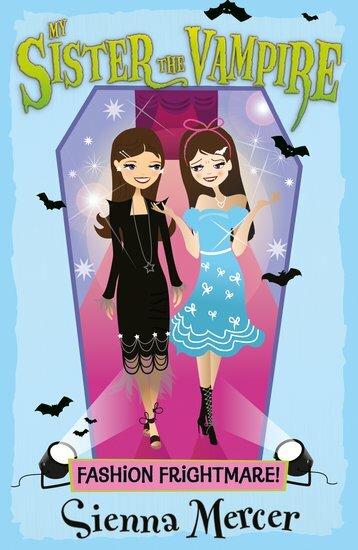 Drop-dead cool and bitingly funny: these vampire sisters are always the stars of the show. I love the mysterious and bloodcurdling lifestyle of Ivy. She is my favourite character. I loved this entertaining easy read. I couldn’t put it down. I absolutely loved this book. It had me tied to it, it was so good.